Apple is set to launch the iPhone 6S on Wednesday September 9 but there's a new campaign for the company to change the name to the iPhone 7 instead. 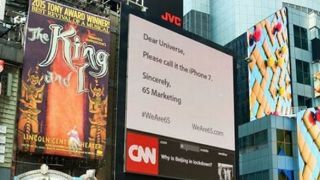 US based marketing agency 6S has purchased some billboard space in Times Square begging the company to skip a name generation as the phones name is so close to its own. There was also a truck with the same marketing message placed outside the Apple flagship store on Fifth Avenue trying to grab the same attention. Let's be honest here: it's very likely this is a marketing agency pulling a shameless PR stunt to get some attention now we're almost certain that the iPhone is about to land. At least 6S has held the name for over 15 years so it's not a recent ploy to grab at Apple's coverage, but the company has taken an inexplicably long while to act and waiting less than a week before the release clearly isn't going to get Apple to change its minds. Apparently 6S chose the name as it sounds so similar to the word "success", but one thing we know for sure: the company won't be able to Google itself very well after the phone is released on Wednesday. All the iPhone 6S rumours so far.